It's like the LTOV. Marxists (and many others) have no idea about how wealth is created. Hmm.. not really true, Ken B.
Marx and Marxists generally knew that industrialisation and capitalism were what created wealth, but Marx and Engels had a bizarre caricature of how it effected living standards, wages and working conditions. They could point to the worst aspects of it (real horror stories) at a particular time, but then falsely generalise to the whole system, while conveniently ignoring evidence available even then which refuted them. Aren't those things -- living standards -- wealth? The LTOV denies a robot contributes value, correct? What is a car made by robots except a form of wealth? Isn't that a sign of not understanding how wealth is created? Ken, (competent) Marxists would argue that you confuse "exchange value" (that should in some sense be an approximation of price) with "use value", that is "utility" of things. Personally i believe they're very confused, but not so much on price theory than on other issues such as the importance of profits. In other words, even a communist state would still have to reward "abstinence". "The LTOV denies a robot contributes value, correct? What is a car made by robots except a form of wealth? Isn't that a sign of not understanding how wealth is created?" Phrased in this way, yes, I agree. Though presumably the diehard Marxists would say such a car has no labour value in it. "What is a car made by robots except a form of wealth?" Robots can create wealth. In a Star-Trek style communist utopia where robots produce most of the goods people need, there would be lots of 'wealth', or 'use value'. But there wouldn't be 'value' in the capitalist sense. And Marx's SNLT was never a fundamental defining feature of capitalism anyway, nor was the mystical surplus value nonsense. Also, in such a Star-Trek world there could still be private production and money profits -- a world with capitalist production modes. LK, isn't Engels, basically, reasserting the so-called "Iron Law of Wages"? Wikipedia has a piece on that which, IMHO, is not bad at all. "The iron law of wages is a proposed law of economics that asserts that real wages always tend, in the long run, toward the minimum wage necessary to sustain the life of the worker." The rest is here: https://en.wikipedia.org/wiki/Iron_law_of_wages There is also a German version of the same page, also not bad, for those who can read it. I think it is fairly clear that the stuff goes way back to Malthus and Ricardo, which is just another proof of how, in reality, backward-looking Marx and Marxism were. Marxism still is, I suppose. Stuck somewhere in the middle of the 19th century and struggling to come to terms with what has happened since, both in economic theory and in the real world , changing as little as possible of what, rightly or wrongly, obsessed Marx and Engels at the time. Yes, these are all excellent points. 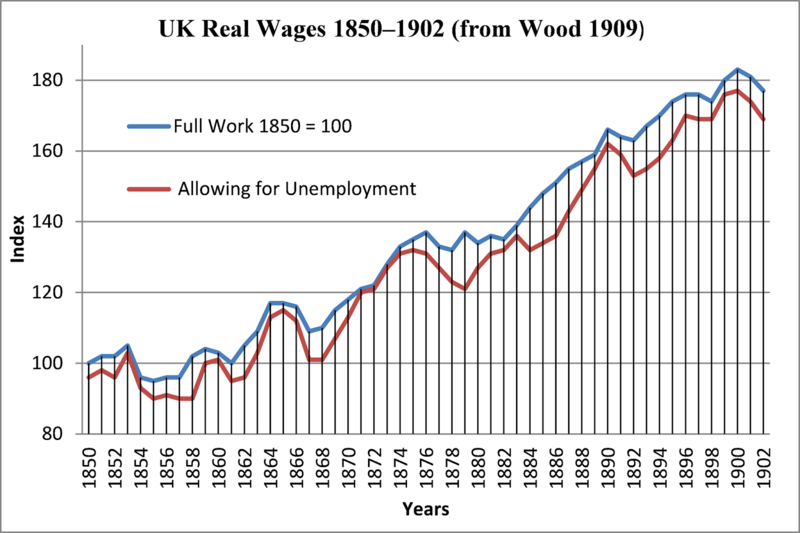 The iron law of wages is basically taken over by Marx from Classical economics, since Marx thinks that workers only tend to be paid the value of their labour-power, which is determined by the abstract socially-necessary labour for the maintenance and reproduction of workers (i.e., they tend to paid subsistence wages). If that means that wages do not tend to be subsistence wages, then the theory already is unravelling. 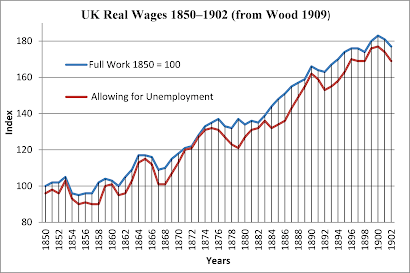 If not, it is still refuted by the history of real wages as seen above. Hey, LK, I may have to come back to that later, since, after having read the passage from Engels in context, I think you might be misunderstanding what he is saying. But just a quick one: Marx does NOT seem to have adhered to the "iron law of wages" which he (and others perhaps) attributes to F. Lassalle. In fact Marx wrote a short critique of Lassalle's "law" in Part II of the "Critique of the Gotha Programme" which is here (in English; I read it in German): https://www.marxists.org/archive/marx/works/1875/gotha/ch02.htm In typical Marx fashion, it is frought with violent irony, to the point of being distatestful, especially if you consider that it was (safely) written after Lassalle's death. As long as Lassalle was alive, if I remember correctly, Marx was not beyond fawing up to him to secure favours or cash, of which Lassalle had quite a lot to give away. In this passage, Marx seems to be saying that the restriction of wages to the bare subsistance standard is not an iron law of nature, but rather a ploy of the capitalists who steal the rest of the worker's product, leaving him with the bare subsistance minimum. I agree with your criticism of what he you say he wrote in Das Kapital, though. If one tends to view the subsistance level as being variable, in accordance with historical and moral values, then the whole thing becomes circular and, as you say, unravels.